Today is the start of the next “first”. Kai is off with his class- and schoolmates on a four-day school trip to Ballerat, a city about 2 hours drive from here. 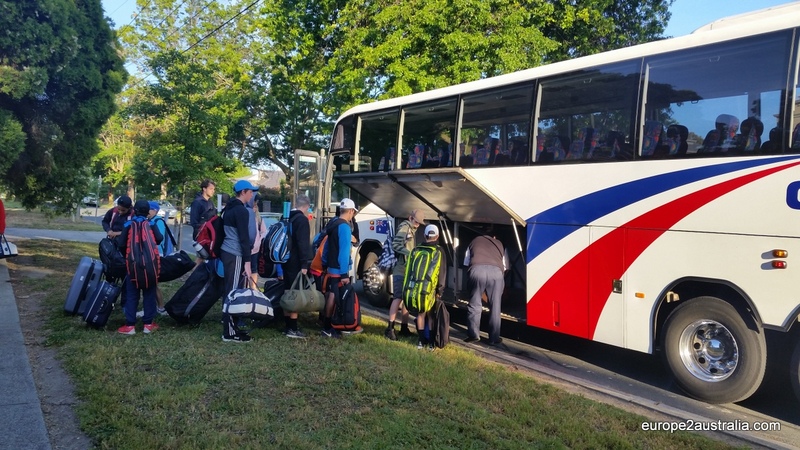 There they will stay at a hotel and take part in a tennis tournament. 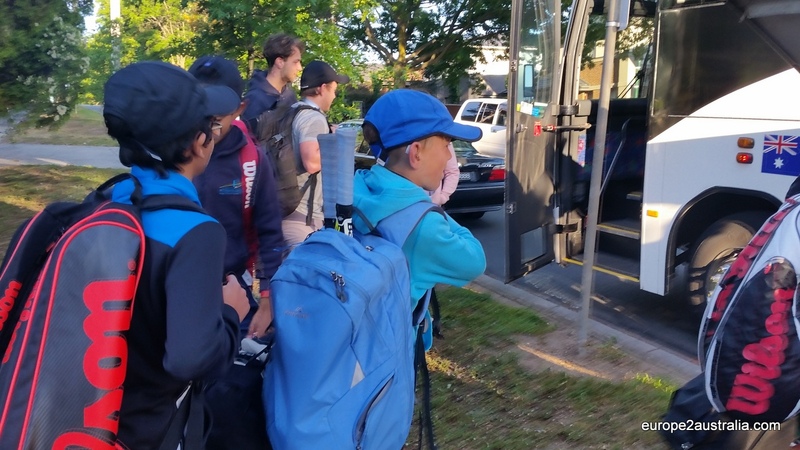 After a having packed the bag last night and making sure everything on the list was accounted for (tennis shoes – check, tennis shirts – check, snacks – check) it is wake-up time at 5.45am. Quick breakfast and shower, tennis clothes on (Kai’s first game is at noon today) and off we go. Willemijn stays at home with Luka still asleep upstairs, so a big hug is in order. And, yep, this one is tougher for mom than for son. The streets are pretty quiet this early in the morning, so we make good time and arrive in a very German manner: right on the dot. 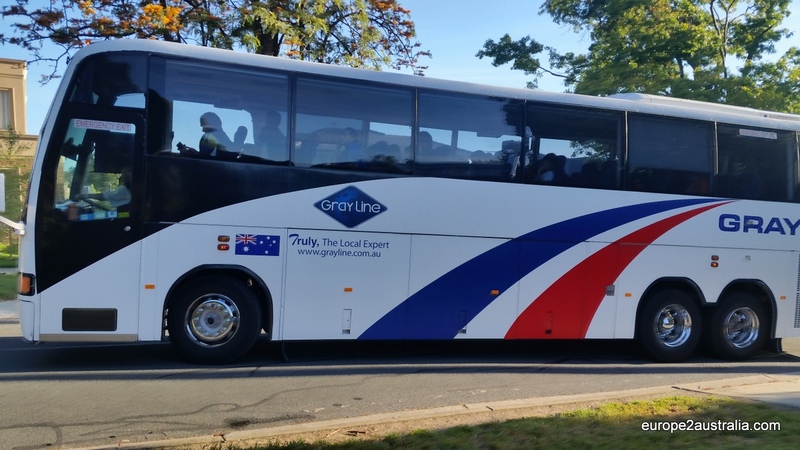 While we are not the first, this still clashes with the Australian way: the teachers show up a good 15 minutes later and the bus only arrives at 6.55am. Waiting for the bus, bus-buddies are selected. Just to be prepared. But no matter. There is a buzz in the air and all the kids are talking excitedly together. The few parents that are still there are forming a group off on the side, looking on and chatting. I see a lot of parents just dropping off their sons and daughtes and leaving immediately after. Seems like they have done this before. Will it get easier with time? The loading of the bus – things have not changed much since I was a kid on my first road trip. Finally the bus arrives and everyone is stowing their bags. 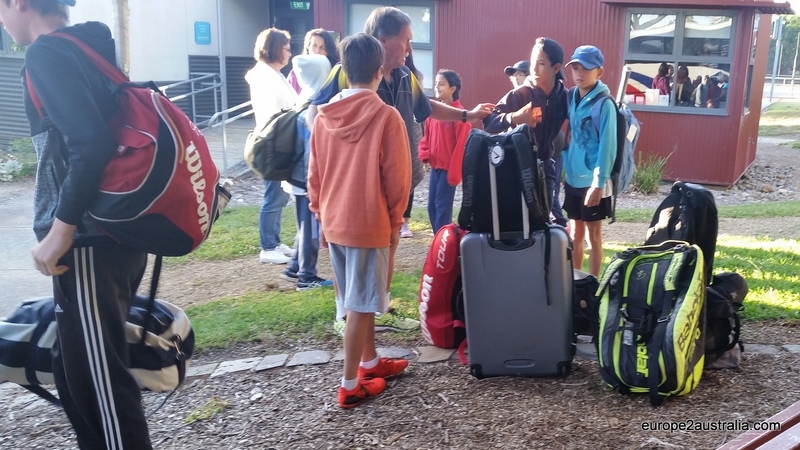 With all the tennis equipment (they are even bringing a stringing machine), bags are bigger than on a “normal” school trip. Excitements are running high and dads with camera phones are not important right now. Finally everything is packed, everyone is aboard and the bus is ready to go. A quick wave and off they go. Almost on time at 7:05am. The last remaining parents shake hands and we head off to our cars. Our hearts and minds on our kids, knowing that they’ll have a blast, hoping that they’ll behave (mostly) and keeping our fingers crossed for the tournament. And I am left to wonder where the time has gone that our son has grown up so quickly. And I am happy for him to have this opportunity. Good luck, Kai! Enjoy yourself! It does get easier, trust me. My son recently came back from a five day bush survival camp. He said it was the best camp he’d ever been on.